Mayor Bloomberg caved and canceled the ING NYC Marathon. I won't lie, I was upset. 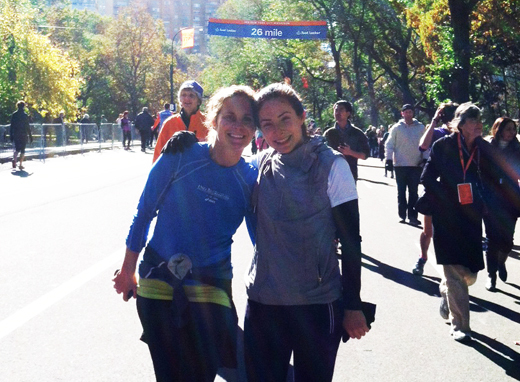 After being evacuated and homeless for over a week because of Hurricane Sandy's hit, the marathon was the 1 thing I looked forward to. 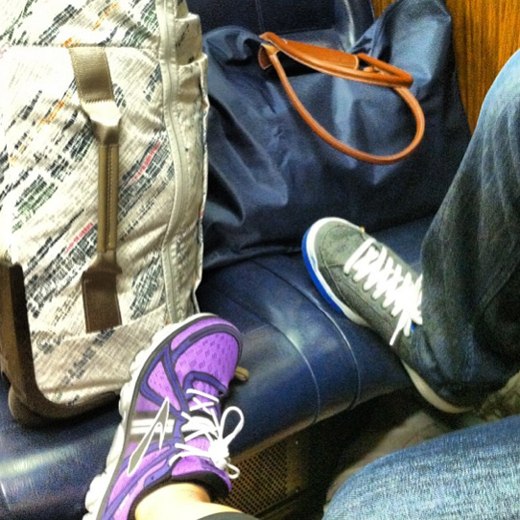 That's me and my boyfriend on the Metro North Train escaping Manhattan to find a warm and safe place to stay. But sometimes you have to accept the things you cannot change in order to summon the courage to change the things you can. 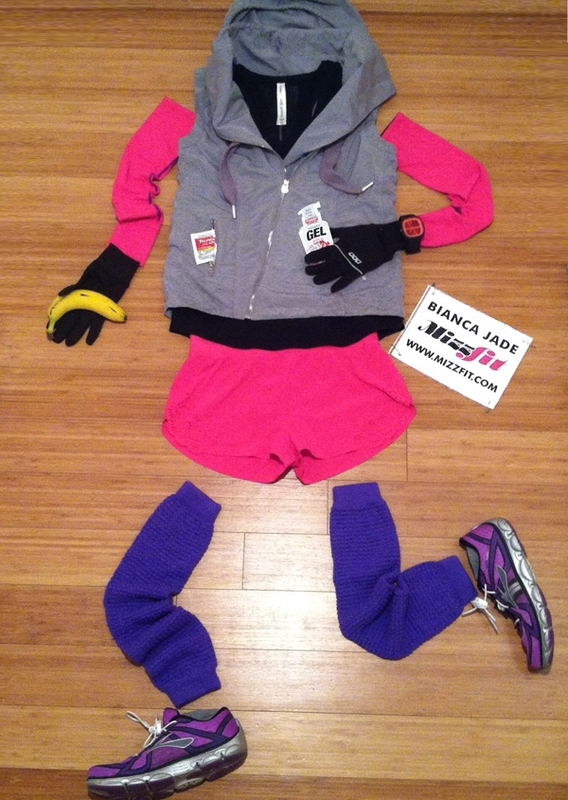 My story begins with the outfit I did not get to wear for the marathon that never happened. I had planned on dressing colorfully in Lorna Jane running apparel. I tested every piece of apparel during practice runs to make sure I'd be comfortable and temperature appropriate. What you don't see is the Vaseline I had planned on lube-ing my feet with, the Swiftwick Pulse Zero socks that I swear by even though they're pricey, and the ibungee speed laces (30") that I will now never run without. Oddly, I discovered that running in short-shorts and long leg warmers in the cold quite suits me temperature-wise. And if you're looking for a stylish layering piece, Lorna Jane's Natasha Sleeveless Jacket is AWESOME. Sigh...at least the whole outfit looks good on my floor. Those are my feet although I'm not sure why she's frowning. 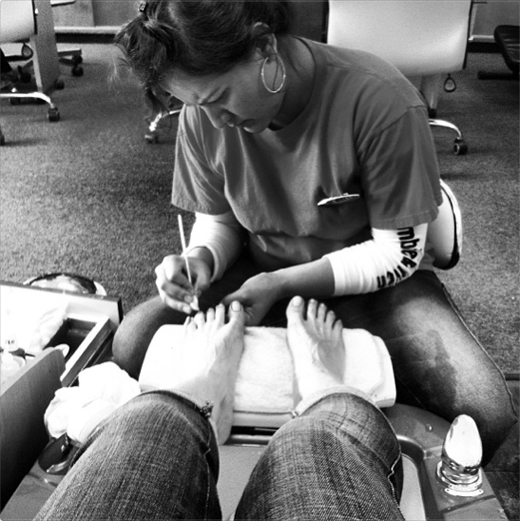 I always get a pre-marathon pedi to prevent any disgusting foot issues that often plague runners like black toe and nail loss. I believe that keeping your toe-nails short and manicured in addition to getting your feet massaged (a day or 2 before you race) will lower the chances of pesky, unsightly problems. Sigh...at least I got a good rub and caught up on celebrity gossip. I spent a lot of time prepping for this marathon that never happened. The fact that I didn't know when I could return home did not stress me out nearly as much as making sure I'd checked all my boxes for race day. Even when I heard my apartment building's lobby was flooded all I could think about was running. I've said it before and I will say it again: marathoners never quit. 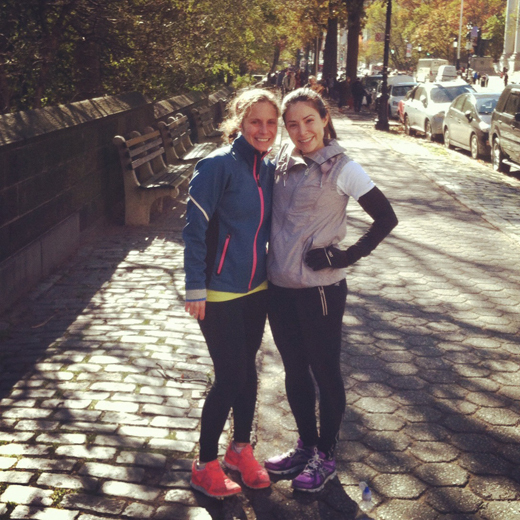 I picked myself up out of my funk and decided that Bloomberg and all the NYC Marathon naysayers couldn't stop me from running. 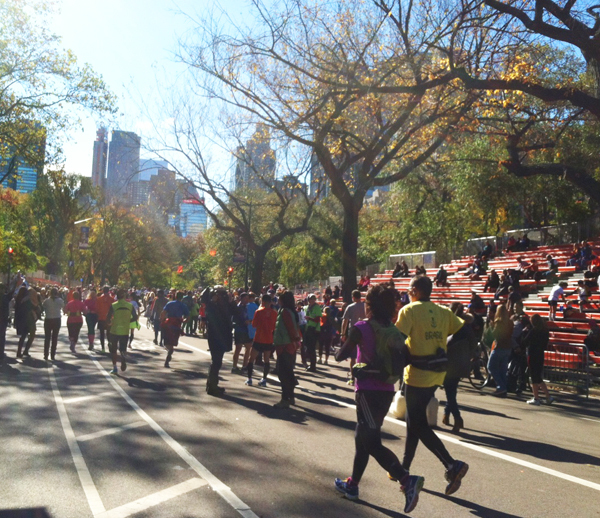 I joined the thousands of people in Central Park on what was supposed to be our marathon day (November 4th, 2012) and ran to the faux finish. 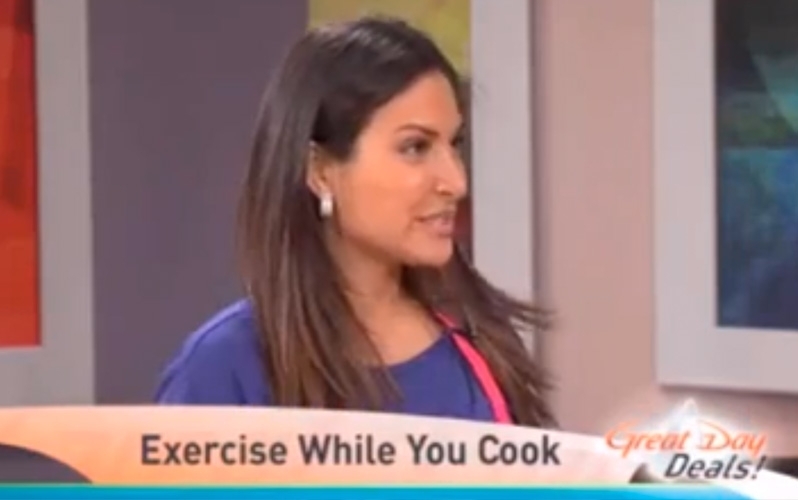 It was fun and memorable because my friend and editor of Baby Bump Fit Tips, Laura Kovall, joined me. Now that's what I call MAKIN' LEMONADE! #fitnessgirlproblems no more. I ate as many as I could IN BED! So yeah, maybe the marathon I trained long and hard for didn't happen, but life goes on. If you're feeling generous, I'm still raising funds for the DeGregorio Foundation in honor of my uncle who I was running for. You can read about that here. Or, please find a way to help out Hurricane Sandy's victims. Don't forget to check out Sherry Short Cakes in NYC! Email her here to place an order. I was thinking about you when I heard it was cancelled but I am so proud of all of the things you did in preperation! You are a true marathoner!! So happy you were safe and hopefully life is getting back to normal. Happy you still got a little celebration after you earned it!!! So nice to hear you were thinking about me. My heart was heavy upon hearing the cancellation news but life goes on and I did enjoy the training process. I have already decided I will run it next year and even do a half marathon in April. So I guess now that just means, I'm even more committed than I set out to be! I actually picked up my medal for the race today. They were giving them out until today. Going to give it to my uncle (the person i was running my race for). I love your comments and appreciate every smile you bring my way. You are always someone I look forward to hearing from! Love your positivity and that you ran anyway and didn't give up despite the cancellation. You're always so inspiring, and I truly thank you for your guidance in that. I ran anyway but I sure didn't run the whole 26.2 miles. I just wasn't in the RIGHT STATE OF MIND for it as I was still pretty disappointed by the cancellation. But yes, I had to DO SOMETHING! And I wanted to see and feel the spirit of all the other runners (both local and international) out there. It felt nice and like the right thing to do for myself...and for my uncle (who I was running for). Thank you for always being so kind. You rock. I'm glad someone noticed the banana in my hand! And yes, the entire marathon situation WAS a mess. But I learned a lot from it and let's just say, I'm not super ramped up for my half marathon in March (which shouldn't be too hard considering I trained for a full). Do you run? Where are your arm warmers from? 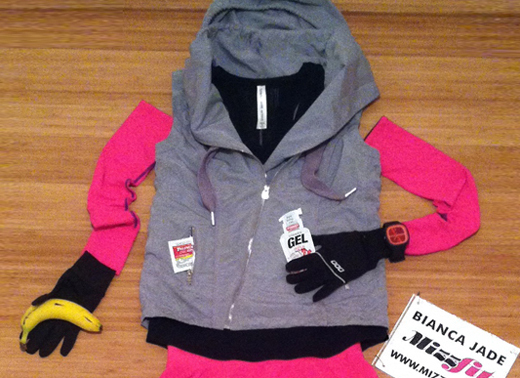 Those arm warmers are oldies but goodies! I got them at Lululemon a couple of years ago and wear them religiously in the cold. They have a thumb-hole and fold over mit for extra finger/hand warmth too. Definitely a good buy and I'm pretty sure Lulu still makes these.